In addition to tracking your consumable inventory items, you can also use InventoryDirect to track tools that you keep in stock. This equipment can be checked in and out of the system similar to a library book. There are two types of Tool transactions in InventoryDirect, Tool Issues and Tool Returns. Required fields are indicated by a red check box ( ). The red check box with the gray background ( ) indicates that one of the two fields is required. Click on the Tools link in the Information & Analysis section of the home page. If you are issuing this tool for use on a work order, enter the WOID. This will populate the Location, Building, Project, Assign To and Budget Code fields automatically with the information from the work order. 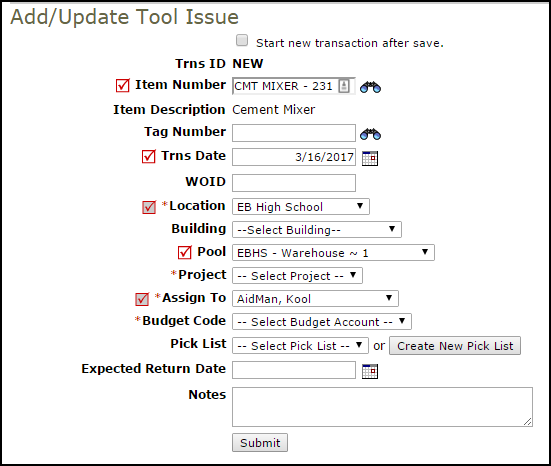 A Tool Issue transaction will also be recorded in the Transaction section of the work order. The Tool Return form will already be filled in with the appropriate information from the Tool Issue form.